What's Laptop Notebook SO-DIMM Memory? Home / All Products / Laptop Parts / Laptop Memory / What's Laptop Notebook SO-DIMM Memory? A SO-DIMM, or small outline dual in-line memory module, is a type of computer memory built using integrated circuits. SO-DIMMs (also written SODIMMs) are a smaller alternative to a DIMM, being roughly half the size of regular DIMMs. SO-DIMMS are often used in systems which have space restrictions such as notebooks, small footprint PCs (such as those with a Mini-ITX motherboard), high-end upgradable office printers, and networking hardware like routers. SO-DIMMs have 72, 100, 144, 200 or 204 pins. The 72 and 100 pin packages supports 32-bit data transfer, while the 144, 200 and 204 pin packages support 64-bit data transfer. This compares to regular DIMMs that have 168, 184, or 240 pins, all supporting 64-bit data transfer. SO-DIMMs are more or less equal in power and voltage rating to DIMMs, and as memory technology moves forward, both SO-DIMMs and DIMMs become available in equal speed (clock speeds such as 400 MHz PC-3200, for example, and CAS latency such as 2.0, 2.5, and 3.0) and capacity (512MB, 1GB, etc.). 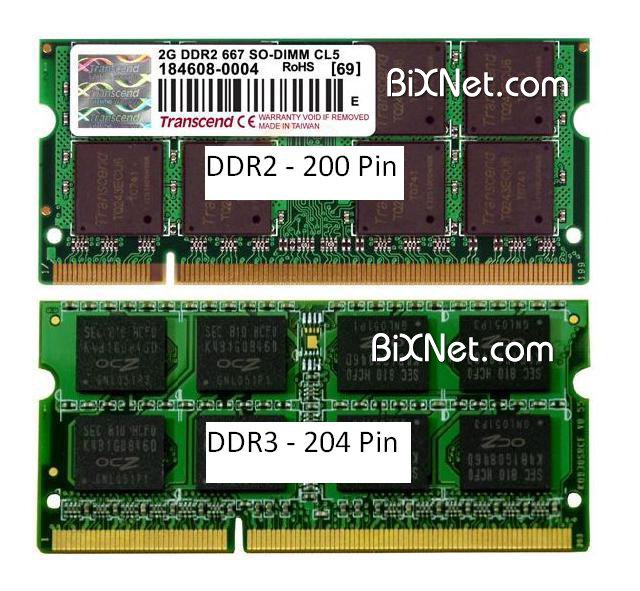 DDR2 SO-DIMM memory modules commonly have clock speeds from 200 MHz up to 800 MHz PC2-6400.